Lombok Is Famous for its traditional earthenwear pottery made from local clay with distinctive “Lombok Primitive” design.You can also purcase handwoven sarongs and fabrics(ikat). Is 5 km to the west of Praya,heading south towards Kuta.This is a weaving village where quality ikat and traditional cloth is displayed and sold.Weavers work outside many of the shops using antiquated “back strap looms” To paintakingly produce works of art. Some of the larger pieces can take several month to weave, and collectors from around the world visit this village to purchase the blanket,sarongs and cloth produced here. Lombok Island is one island that has a wealth of beauty and diverse natural attractions, cultural arts and traditional handicrafts are very impressive. One of them is the traditional craft of weaving or "songket". 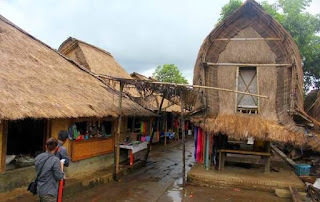 Sukarara Village is the name of a lovely little village and is one of the traditional craft of weaving center located in the Village District Sukarara Jonggat Central Lombok West NusaTenggara. Location Sukarara village is 25 Kms from the city of Mataram, and 5 kms from the town of Praya or 5 minute journey by car or taxi. Most of the women in this village Sukarara worked as a weaver. To maintain and preserve the culture and traditional weaving are inherited by their ancestors in the village so the women Sukarara is required to learn to weave, even from an early age children of their parents have inherited his skills and teach their daughters to weave with initial motive or the motive is very simple to more easily understood and learned by their children how to weave a good and right to get a good quality woven later. This weave job they usually do on the front porch, and this habit they still do to this day. This scenery you will encounter in almost every house there along the road village Sukara you pass. Woven fabric or songket of Sukarara Village has its own characteristics with different design or motif with other woven fabrics inIndonesia. A work of exquisite fabrics and artistic design that has exclusively produced by the skilled hands of village women Sukarara. With special characteristics and traditional design depicting the lifestyle of the ancient island of Lombok with motifs of the traditional house and barn and gecko motif, still defend to this day. Although only by using a traditional loom very simple, but the weaving of Sukarara Villagehas a very good quality and very impressive. Woven fabric design Sukarara Village is indeed very Oneness recognized when seen from the application pair colors with the traditional pattern of land east of the original island of Lombok. Raw materials they use are cotton yarn, silk, gold silk and silver silk thread. As for the dyes they use are from natural dyes such as reddish brown color of mahogany, light brown color of teak trunk, brown acid soil from seeds,dark brown color of rotting banana stems, and purple color of the mangosteen peel and wine. This makes the woven fabric or songket of Sukarara village is famous for its characteristic bright patterned songket. And also the weaving village of Sukarara are now widely known and well liked by foreign tourists. As you might know that in the weaving work undertaken in the village of Sukarara is just using a traditional loom very simple, then the price of woven fabric or songket this depends on the difficulty of determining motive and the long processing time. This makes the price of traditional woven cloth Village Sukarara very expensive.